The HACH 2100Q Portable Turbidimeter provides confidence your measurements are right every time. 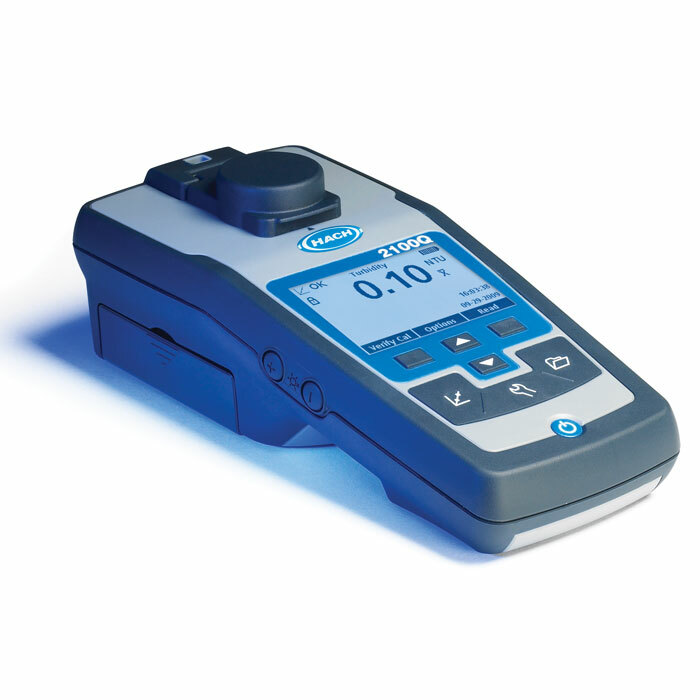 Single-standard RapidCal calibration offers the simplest solution for low-level measurements. Single-step verification and on-screen assisted calibration eliminates the need to reference complicated manuals. Exclusive algorithm in the Rapidly Settling Turbidity mode provides accurate, repeatable measurements for rapidly settling, difficult-to- measure samples while eliminating the need for redundant measurements and estimating. Up to 500 measurements are automatically stored in the instrument for easy access and backup. Stored information includes: date and time, operator ID, reading mode, sample ID, sample number, units, calibration time, calibration status, error messages and the result. The two-detector optical system compensates for color in the sample, light fluctuation, and stray light, enabling analysts to achieve laboratory-grade performance on a wide range of samples, even under difficult site conditions. H2100Q-01 Hach portable turbidimeters are supplied with four AA alkaline batteries, a carrying case with insert, StablCal primary calibration standards in 1 sealed vials (20, 100, 800 NTU), 10 NTU primary verification standard, 6 sample cells with screw-tops, instrument manual (printed and on CD-ROM), quick start guide, silicone oil and oiling cloth. signal (90°) to the transmitted light scatter signal.